Assemblywoman Addie A.E. 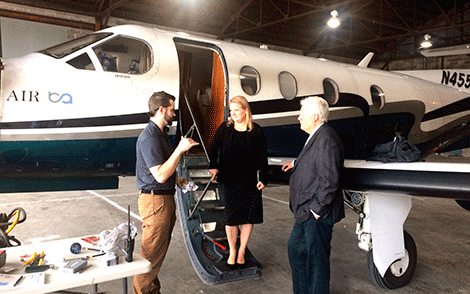 Jenne discusses Boutique Air's new hangar space with Boutique's manager of operations in Massena, Ian Whalen (l), and Massena Town Supervisor Steve O'Shaughnessy. Boutique will be moving its storage and repair space from a 1940's era hangar without a door to a 15-year-old hangar recently purchased by the town of Massena. MASSENA -- The state will pay $125,000 to assist the Town of Massena’s purchase of a hangar at Massena International Airport, according to Assemblywoman Addie Jenne, D-Theresa. Supervisor Steve O'Shaughnessy said the funds will assist in creating new jobs in the community as well as improved service for passengers. "We simply didn't have the funding to make this purchase without the help from Assemblywoman Jenne. According to the lease we had, the private firm that had the hangar built had the right to take it down or sell it. Our purchase of the hangar will benefit the town in the short term and offers the potential for future growth," the supervisor said in a prepared statement from Jenne’s office. The town board had reached an agreement with a private firm in the region to have a hangar built on the airport property 15 years ago. The firm has leased the property the hangar sits on from the town, but the lease is now set to expire and the tenants had indicated they didn't want to renew the lease. The Massena town supervisor said the construction cost for the hangar would be over $1 million. He said the town was concerned the hangar's owner could sell the hangar and have it moved off site. "Boutique Air currently leases an older hangar we have, but that building is not equipped for work during the winter months. They want to have a maintenance crew stationed here. They have one mechanic they have brought into Massena, and they are looking to hire a second mechanic," he said. He said the hangar the town is purchasing for $300,000 will provide Boutique Air with 7,000 square feet of space for maintenance work and storage of a spare plane for use on the East Coast. He said the space will also provide the airline with an opportunity to contract out maintenance work on other planes. "We had encouraged Boutique to set up a maintenance program here at our airport. They have also pledged to keep a spare plane in Massena. That will allow us to charge more in rent for the larger space, and it will improve reliability for the flights coming in and out of Massena," O'Shaughnessy said. Boutique Air sells three round trip flights daily between Massena and Boston.